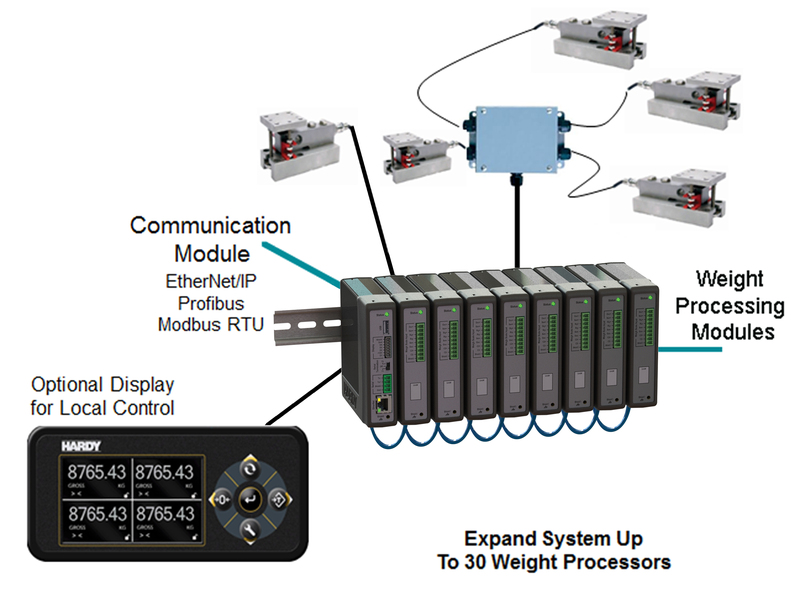 The HI 6600 series is a modular system of weight processors that deliver up to 30 channels of fast, stable, high-resolution weight readings to PLCs, PACs and DSCs over a single fieldbus network connection. Ideal for applications that require more than one channel of weight, such as inventory tank farms, batching systems and multi-head filling machinery; each channel of the HI 6600 processes signals from up to four connected load cells then outputs the entire system’s weight data over EtherNet/IP, Ethernet TCP/IP, Modbus RTU, Modbus TCP/IP or Profibus-DP. Just snap the number of weight channels you need onto a DIN rail, cable the units together to the Gateway Module using standard Cat5e cable, connect sensors, power up and press DISCOVER- the system will automatically identify all the modules connected together and make them addressable for set-up and calibration through the PLC, embedded Webserver or optional display. A Rockwell EDS_AOP simplifies integration using RSLogix. consuming just 3.9 watts with an optional front panel display.